[Note: My ex-church Grace Bible Fellowship of Silicon Valley is fond of ‘camping out’ on a few Scripture verses, even words, to prohibit Christian women from using the gifts that the Holy Spirit has given them in serving the church, including in teaching, preaching and leading. GBFSV pastors/elders’ claim this is ‘Biblical’. In point of fact, it’s not. Baptist women have been leaders, teachers, and missionaries for hundreds of years. I remembered that my Presbyterian grandmother’s (she died at 102 years old) medical missionary friends — women doctors — who practiced medicine, taught The Gospel in villages around the world, and they improved lives wherever God put them. I saw the slides as a child. When the principles and practices of the kingdom of God are made subordinate to the traditions of men, the power of Spirit-filled living becomes a figment of our collective imagination. When religious leaders place shackles on God’s people to keep them from functioning as He has gifted them to function, the church becomes a powerless shell of immobility. Without the vivifying energy of the Spirit in the body of Christ, the King’s men and women become regal attendants fighting at each rather than royal ambassadors working with each other. If you have ever experienced a dead church, you know intuitively that the deadness occurs because leadership is controlling guilty people rather than empowering gifted people. The Scripture is emphatic that the Spirit gifts His people–men and women–with gifts of teaching, service, leadership, mercy, organization, etc… Good leaders get to know their people, find out how they are gifted, and empower them to fulfill their calling. The Bible is replete with examples of men and women gifted by God to teach and to lead. No Bible-believing Christian seems to have a problem with men leading or teaching, but women fulfilling those roles, as gifted by the Holy Spirit, seems to cause consternation in the lives of some who are more familiar with tradition than truth. We have dozens of illustrations in the New Testament of women teaching men (Priscilla, Anna, Philip’sfour unmarried daughters, and many, many more). There are also dozens of additional illustrations in the Bible of women leading men. The verses above seem to say, at least on the surface and without the four words I’ve supplied, that no woman should ever teach any man; that no woman should ever assume any ‘authority’ over any man; and that all women must always be quiet in the presence of men. Of course, most evangelical conservative men would say that the Apostle Paul was only addressing women “in the church” and “in the home” so that women in the political world, corporate world, and secular world, are not under these restrictions. I find it humorous that conservatives complain of “potential malignancy” in one’s gospel orthodoxy if one can find a way to make this I Timothy 2 text say that it is okay for women to teach men or have authority over men “in the church.” Why is that humorous to me? Because those same conservative men have already found a way (rightly so) to explain how a woman can have leadership over a man and teach a man in every other realm of life (politics, business, etc…). Do we remember when Condi Rice, Secretary of State, spoke to the Southern Baptist Convention in 2006? She taught us Southern Baptist men a great deal about war and the bombing of terrorists, and we applauded her leadership as Secretary of State. So much for the gospel malignancy theory. (1). Paul is addressing a problem Timothy had with a specific woman teaching heresy to a specific man in the church at Ephesus. (a). Paul gives instructions to “women” (plural) in the beginning of chapter two (i.e. how to dress modestly, live of life of good works, etc…), but beginning with verse 11, Paul switches from the plural noun (women) to the singular noun (woman). The definitive article “the” is in the original Greek (i.e. “the woman”), not the unfortunate translation “a” woman (NIV; NASB). Paul moves from instructions to women in general (vs. 9-10) to a very direct instruction for a specific woman in verse 11. You can verify this quite easily with any online interlinear. (b). The “she” in verse 15 is third person singular (again, the NIV and NASB unfortunately mistranslates the third person singular Greek pronoun in v. 15 with the plural English noun “women”). The “she” of verse 15 is the same woman in verse 11 and verse 12. She is the woman who needs correcting. (c). “…if they continue” (v.15). The word “they” is the accurate translation of the third person plural used by Paul. This plural pronoun identifies not only the woman doing the teaching, but also the man whom she is deceiving (“the woman” and “the man” of v. 12). (d). The verb “continue” is in the aorist active subjunctive. This verb’s tense confirms that the instructions Paul gives in vs. 11-15 are designed for the woman and the man in question (v. 12), to two people who are alive at the time Paul is writing and not to those who are either dead or not yet born (i.e. Eveor women in general). (2). The woman in question was teaching error out of her ignorance and should be shown mercy. Mercy and love toward false teachers is one of the themes of letter we call I Timothy, particularly because the assembly at Ephesus was a church filled with people from pagan backgrounds: “As I urged you upon my departure for Macedonia, remain on at Ephesus so that you may instruct certain men not to teach strange doctrines, nor to pay attention to myths and endless genealogies, which give rise to mere speculation rather than furthering the administration of God which is by faith. But the goal of our instruction is love from a pure heart and a good conscience and a sincere faith” (I Timothy 1:3-5). Paul has already spoken of the ignorance he was in before he was taught the truth: “(I) was a blasphemer, and a persecutor, and insolent; but I received mercy, because being ignorant I did it in unbelief“ (I Timothy 1:13). Paul mentions how Eve sinned in ignorance: “…it was the woman (Eve) who was deceived and became a sinner” (I Timothy 2:13). The entire first two chapters of I Timothy are leading up to Paul expressing sympathy toward, and encouraging Timothy to display love to, that woman teaching error. We know that Paul wrote this letter in response to problems Timothy was facing in Ephesus, and those problems were known by Paul (I Timothy 3:14-15). This is a personal letter, not a general epistle, and proper interpretation requires the reader to delve into why Paul wrote the letter in the first place. (3). Paul expressed hope that this woman will be saved by Christ, even though she is in error. (4). Scripture only expresses a prohibition on women teaching error, never on women teaching men. The problem with Jezebel was not that she “teaches and leads.” The problem with Jezebel was that she taught and led others “astray.” The only solution for a woman who teaches and leads astray is for her to first learn the truth. This is precisely the solution Paul proposes to Timothy for the woman of I Timothy 2. She must first learn “in quietness and full submission” (v.11). By the way, this is also a good practice for any man who is teaching error. He should be confronted and told to FIRST learn in quietness and submission before he attempts to teach. (5). The people who misinterpret Paul and attempt to prohibit women from teaching or leading men are ignoring the entire tenor and teaching of the New Testament. God empowers His people through giftings and anoints His people to fulfill their calling through the Holy Spirit. The giftings of God are never distributed according to gender. The calling of God is never limited according to physiology. When the daughters of Philip prophecied, it was by the giftings of God and the anointing of the Spirit. When Anna taught the men in the Temple it was in fulfillment of the calling of God on her life and through the giftings and anointing of the Spirit. From Priscilla, to Lydia, to Junia, to Phoebe, and to all the rest of the New Testament women God used to expand His kingdom through prophesying, teaching and leading other men and women, God has gifted and anointed as many women as He has men. Let’s not traditions trump truth. *Recommendation: I recommend Wade Burleson’s books which can be purchased from sellers like Amazon. 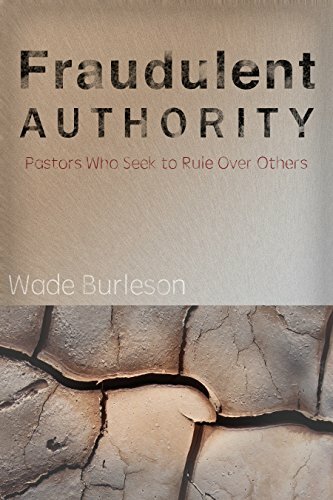 Wade’s most recent book is Fraudulent Authority, about abusive church leaders claiming power over Christians that God has never given church leaders. Over on The Wartburg Watch blog http://www.wartburgwatch.com/some commenters/Christians know the history of the abusive heavy-Shepherding Movement. It’s un-Biblical teachings are now spread via Mark Dever’s 9 Marks organization in Washington, D.C. and other authoritarian groups like Acts 29. The most “important mark” of a “healthy church” as Wartburg Watch commenters noted is “Love” in the Bible, which NEVER made it to Mark Dever’s 9 Marks of a “Healthy Church”, which is just abusive Shepherding all over again. Resource/book: The Shepherding Movement: Controversy and Charismatic Ecclesiolgy by S. David Moore. After doing some background research, the book I picked as probably the best one for overall history and analysis is *The Shepherding Movement: Controversy and Charismatic Ecclesiology* by S. David Moore. What would you say were the 9 (or whatever number) marks of the shepherding movement? Is there a way to sum it up? I can’t seem to get my head around it. I don’t know if there is a CliffNotes version, or not. I’ll give a shot at an overview of what I know & experienced. Late 60s – early 70s and the Charismatic Movement swept through the US – impacting all ages (though the largest percentage were highschool & college age) AND all denominations. People who were not believers as well as people who had been believers and church members for years. These people encountered God, and it changed them. They had tasted and seen that the Lord was good. I know heroin addicts who stopped overnight and never went back. I know church members that had been content with feeding on their Sunday sermons, that began voraciously reading Scripture. I know highschool students who gathered together in groups of 3 or 4 to worship and praise God, to pray to Him and to seek His face. People continued going to their denominational church, and would meet with other charismatics at other times. Young people who had not been church members, would go wherever they could find a church – to a Southern Baptist church on Sunday mornings, a Methodist church Sunday evening, an Assembly of God on Wednesday night. And when there wasn’t an official church meeting somewhere, they would get together (again across all denominational lines) in homes, or offices, or the back of a motorcycle shop to worship, to share what they learned that week, to pray for each other, etc. I say all this to point out that no man was in charge. No organization was determining who did what when. And in response, several men already in various ministries decided that something needed to be done. There was concern that people were not being held accountable, they might not be maturing. These were already nationally known speakers and authors, and had established relationships among themselves (that sounds familiar). It is within the above that the Shepherding/Discipleship movement was launched. I’ll continue in a following post on what came next. The discipleship leaders were initially involved with a ministry in Florida whose leader committed sexual sins. In response to this ministry’s failure, they sought protection from such failure by committing to each other for accountability. So, we had a large number of on-fire Christians going from one meeting to another, one denomination to another, caravaning to other cities for some traveling evangelist, spending hours reading books or listening to teaching tapes, as well as talking to and teaching each other. The men, Mumford, Simpson, Prince & Simpson (Baxter joined later) thought that the burgeoning charismatic movement needed to be accountable to someone and that someone needed to oversee it in order for the people to grow and mature. They named themselves Christian Growth Ministries. Spiritual authority, spiritual covering, delegated authority. Spiritual covering (everyone had to have a personal shepherd). Unquestioned obedience to your shepherd. Wives’ submission & obedience to husbands. Not gossiping, no negative speech, no spreading strife. This church – Elitism (we’re the ones who are doing it right). Not making any decisions without your shepherd’s approval. Obeying your shepherd even if he is wrong & trust God will fix it. Leaving this church and your are leaving God. Shunning anyone who has left. I’m sure I’ve overlooked some aspects. Wade Burleson is a pastor, writer and historian who lives in Enid, Oklahoma. He is a native Oklahoman, born in 1961 in Oklahoma City, but he spent his early years in Texas. His wife, Rachelle, DNP, APN-CNS, serves as a Professor of Nursing at the University of Central Oklahoma in Edmond. Wade has served as Lead Pastor of Emmanuel Enid since 1992. Wade has written over 2000 articles on theology, history and current events, many of which have been published in professional periodicals. He is an expert on the assassination of Abraham Lincoln, and is working on a team assisting Booth’s descendants in attempting to obtain DNA from the “body in the barn” the government identified as John Wilkes Booth. He writes on theology as part of his career, but enjoys writing narratives of history as a hobby. Wade also gives multi-media talks to civic, genealogical, and charitable organizations. His most requested multi-media presentations include (1). White Gold: Thomas Jefferson and the Great Salt Plains; (2). A Transient Abode: Abraham Lincoln, John Wilkes Booth, and Boston Corbett; (3). The Greatest Game Ever Played: Carlisle and Army and the Origins of the NFL; and (4). Red Earth Courage: The First Secret Mission of the Civil War. A student of history and genealogy, Wade has written extensively for his immediate family on the lives of their ancestors. On the maternal side of his family, Wade is the direct grandson (16x) of Geoffrey Chaucer (AD c. 1343 – 1400), the father of English literature. His maternal great-great grandfather, Charles T. Cherry (1801 – 1893), immigrated to America from London, England in 1831 as a missionary to pioneer Sunday Schools in the Mississippi Valley. Charles later worked as an agent for the American Sunday School Union and became an author of several Christian books written for children. Wade’s paternal ancestors, the Burlesons, also immigrated to America from England, settling in the Carolinas during the early 1700’s. Wade’s great-grandfather (7x), John Crawford Burleson (1729-1776) served under George Washington and died in the Battle of Trenton in December 1776. Wade is a cousin to Rufus Columbus Burleson (1823-1901), President of Baylor University and Pastor of FBC Houston, and to General Edward Burleson (1798-1851), former Vice-President of the Republic of Texas. Wade’s maternal grandfather, F.T.D. Cherry (1912-1970), was an All-Conference tight end and track star for the University of Oklahoma and became a Christian evangelist. Wade’s father, Paul Burleson, served as pastor of eight churches in Oklahoma and Texas from 1950-2007, including the influential Southcliff Baptist Church in Fort Worth, Texas from 1976-1982. Wade’s mother, Mary Burleson, is a retired Senior Editor for Random House. Are The Claims of Grace Bible Fellowship of Silicon Valley Pastors/Elders That They Are Being ‘Persecuted’ Because They Are Being Held Accountable…’Biblical’? As the pressure mounts on the Grace Bible Fellowship of Silicon Valley pastors/elders, instigated no less by all of their wrong decisions, bad decisions, and ultimately bad theology, they haven’t humbled themselves. They’ve dug in deeper. They’ve claimed in emails to church members that they are now ‘being persecuted’ and need ‘prayers’ for protection for the GBF Body.